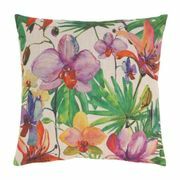 Island Paradise Decorative Throw Pillow 17 x 17. This beautiful paradise pillow evokes lazy days on a sun-drenched island. It's perfect for brightening up your living area with energetic colors and a happy design. Orchid pinks, oranges and yellow pop off the lush green palm fronds set against a calming ivory background. Toss this decorative pillow on any bed, sofa or chair to add stylish personality. Zippered cover for easy removal and cleaning. Machine wash cold. Do not bleach. Do not tumble dry. Iron low heat.